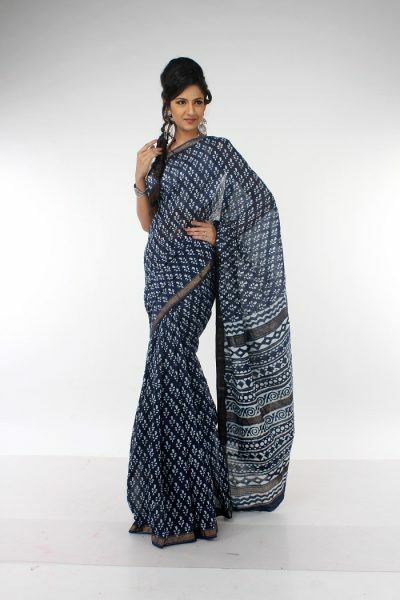 The motifs and buttis on the sarees are hand-woven in handloom and we use separate needles for each motif. Gold, silver or copper are used to coat those motifs. Whether you are opting for traditional motifs like lotus, flower, and peacock, or contemporary motifs like dandidar and chatis, all the variety adorns the fabric on our sarees. The Chanderi Sarees offered by Mrignayani is well known for the sheer texture or transparency offered by it. To maintain the transparent quality of our sarees, we use single Flature quality of yarn. The glue is not separated from the raw yarn and this offers the desirable shine and transparency. The fashion element in our Chanderi Sarees has helped it to secure a special place in the Indian handloom saree industry. The Chanderi fabric is treated to be the most traditional fabric used to weave the drape. If you are a woman having a love for fashion designer sarees, browse through our wide range of Chanderi Sarees and fall in love with each. Why Is Mrignayani The Ultimate Choice For Chanderi Saree? Improve the quality of our Chanderi Sarees with each passing year so that we can offer the best to our customers. Display and sell a wide range of weaves and crafts which comprises of poetry weaven in Chanderi. The raw material used in our store offering chanderi saree has been sourced from reliable suppliers so you can have complete peace of mind. Believe in transparent mode of transactions with no hidden costs involved. Maintaining the delicate zari work on our Chanderi sarees is quite easy as a dry clean is all you need.